New York, NY — In a new book for young readers ages 10-14 scheduled for publication on September 15, 2015, Chelsea Clinton breaks down some of the world’s biggest challenges and shares inspiring stories of young people who are already making an impact in their own communities and around the globe. Filled with visuals including charts, graphs and photographs It’s Your World: Get Informed, Get Inspired & Get Going will address some of the world’s most challenging issues including Poverty, Homelessness, Food Insecurity, Access to Education, Gender Equality, Epidemics, Non-Communicable Diseases, Climate Change, and Endangered Species. 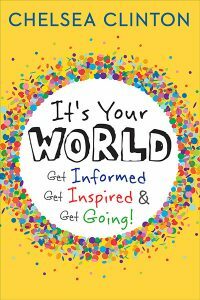 It’s Your World: Get Informed, Get Inspired & Get Going! will be published in the U.S. by Philomel Books, an imprint of Penguin Young Readers. International editions will be published simultaneously in the U.K., Ireland, Australia, New Zealand and Canada through Penguin Random House, with foreign language editions to follow. Chelsea Clinton has always been interested in making the world a better place. When she was a child in Little Rock, Arkansas, one of her favorite books was 50 Simple Things Kids Can Do to Save the Earth, and as a teenager in Washington, D.C., she led her school’s service club. While at Stanford, Chelsea worked as a reading and writing tutor and volunteered at the Children’s Hospital. Today, she is Vice Chair of the Bill, Hillary and Chelsea Clinton Foundation where she helps lead the work of the Foundation across its various initiatives, with a particular focus on work related to health, women and girls, creating service opportunities, and empowering the next generation of leaders. Chelsea holds a BA from Stanford University, an MPH from Columbia University, and an MPhil and doctorate degree in international relations from Oxford University. She lives in New York City with her husband Marc, their daughter Charlotte, and their dog Soren.